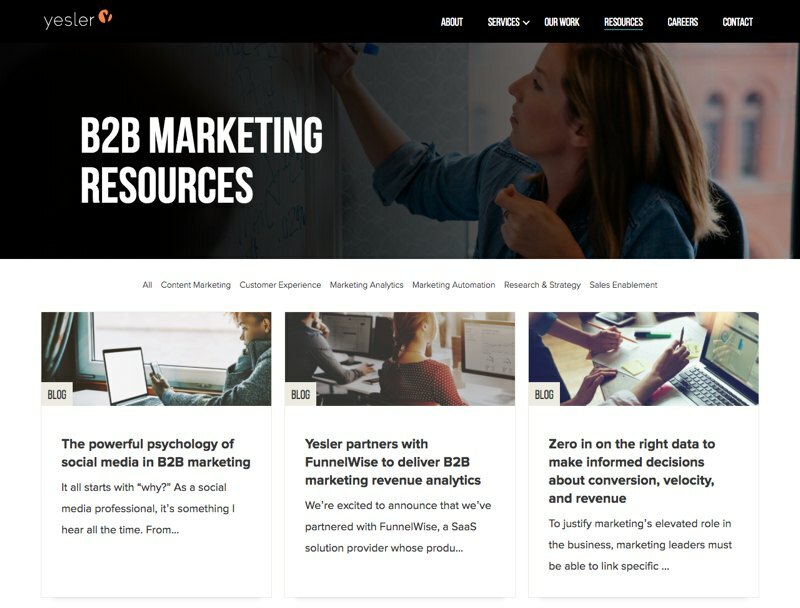 If you’re looking for inspiring and actionable marketing insights from agencies that live and breathe B2B marketing you’ve come to the right place. 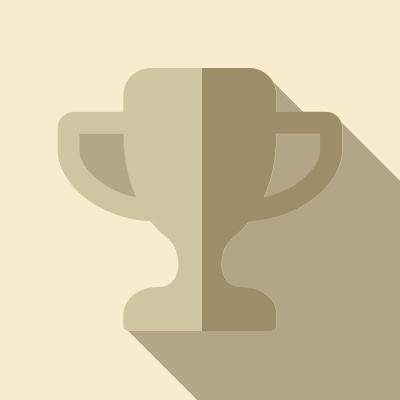 Here are the very best marketing agency blogs online today. As you know, there are masses of good-quality B2B marketing blogs on the web. But where do you find the top content and advice written by the people that produce the very best in B2B marketing every day? We decided to dive in and hand pick the very best of the bunch for you to read and follow. 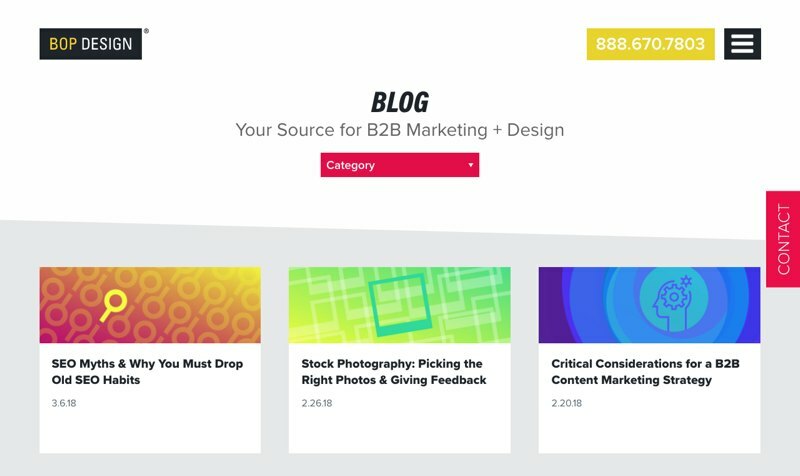 Whether you’re just starting to learn the ropes or a seasoned B2B marketing professional, these agency blogs give you the tools, tips, insights and techniques you need to refine your craft. We're always looking for the very best B2B marketing and lead generation content so if you'd like us to consider your blog for inclusion in our Top 50, you can submit it to us below. 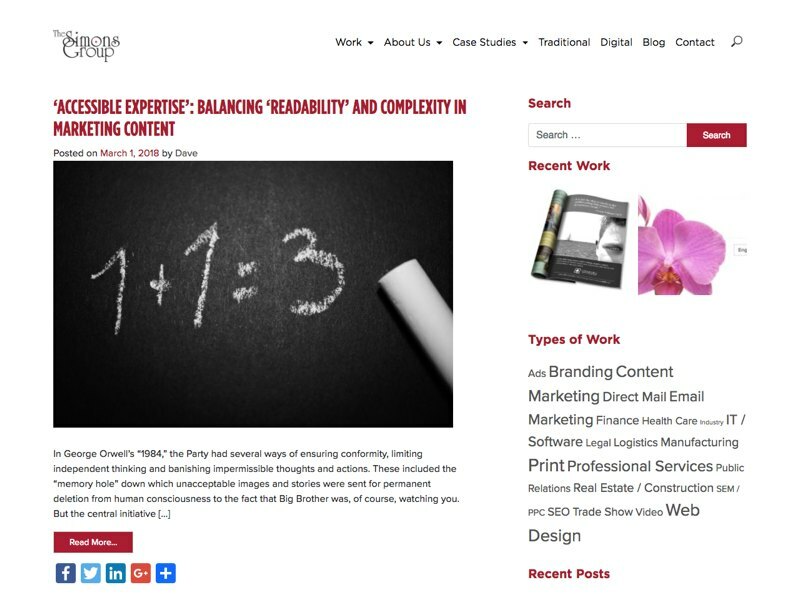 If you are looking for the ideal B2B marketing blog, one charged with insight, wit and a deep understanding of the unique challenges of B2B. This would be it. Irreverent and fun, B2B as it should be. You come away knowing that these guys know their bacon and eggs. And they’re enjoying it. 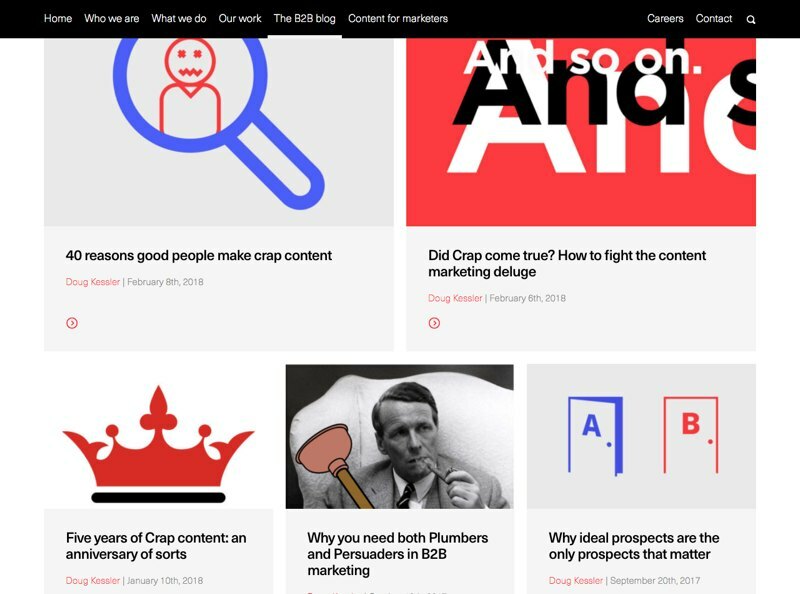 With a really fresh look and feel, BOP Design covers a wide range of topics, 22 in fact (count them). From Advertising to WordPress, the posts contain some great insights. My favourite is “Evaluate Your B2B Marketing Strategy with 5 Simple Questions” by Rachel Cunningham which offers a quick route in to weighing up your current strategy. From the moment you skim over the range of individual blog titles, you know that these guys are really under the skin of B2B. From exploring the tension between ‘Readability’ and ‘Complexity’ in copywriting, to some great detail around getting the most from your LinkedIn page and the CTA optimisation stuff you’d expect. My favourite article at the moment from The Simons Group blog is “A case for the ‘who’, ‘what’ and ‘how’” which should be thought provoking for any marketer or company owner. Wow! With a super high design content these guys are definitely walking the walk. What’s more, when you dive into their content, it’s really very good, with a strong focus upon content marketing. The articles are in depth and informative. As an agency they have a very clear focus on creating brand narratives and generating meaningful conversations. And their blog frames their business offer perfectly. With some great high level posts and a whole section for infographics, LoSasso has something for everyone. I particularly liked the ‘Know your niche’ post which walks through a range of techniques for aligning your communication messaging and style to a laser targeted audience. I also came away with several more useful marketing tools that I know are going to save me time and make day to day research tasks easier and faster! I must say I was taken with Chris Hawk’s ‘knowledge-bombs’ on the subject of doing video for social media (Chris is BigWing’s Resident Video Yoda). Some very solid advice not just technically, but on the practicalities of generating the right type of content for a social network. 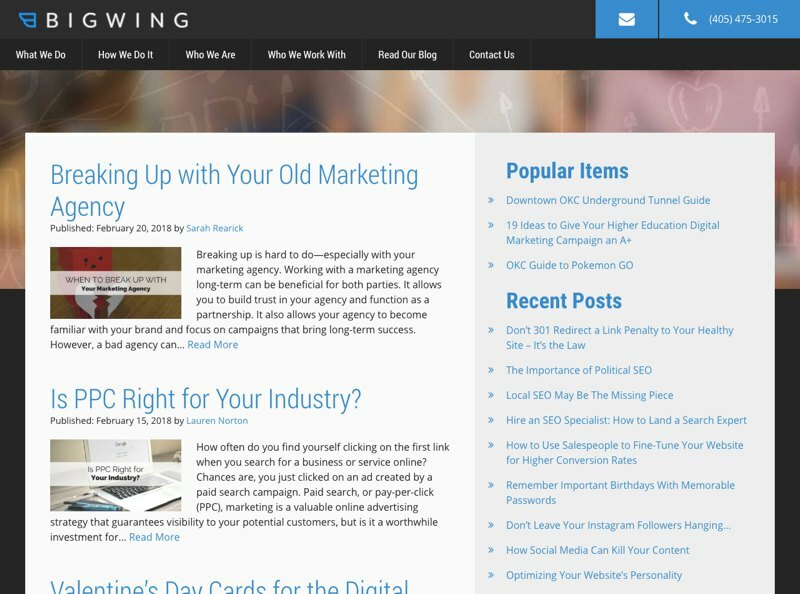 BigWing position themselves as a technical agency, and have some in depth case studies on specific technical challenges overcome for their customers, such as one that involved a 301 Redirect. Which speaks volumes about their focus and application. 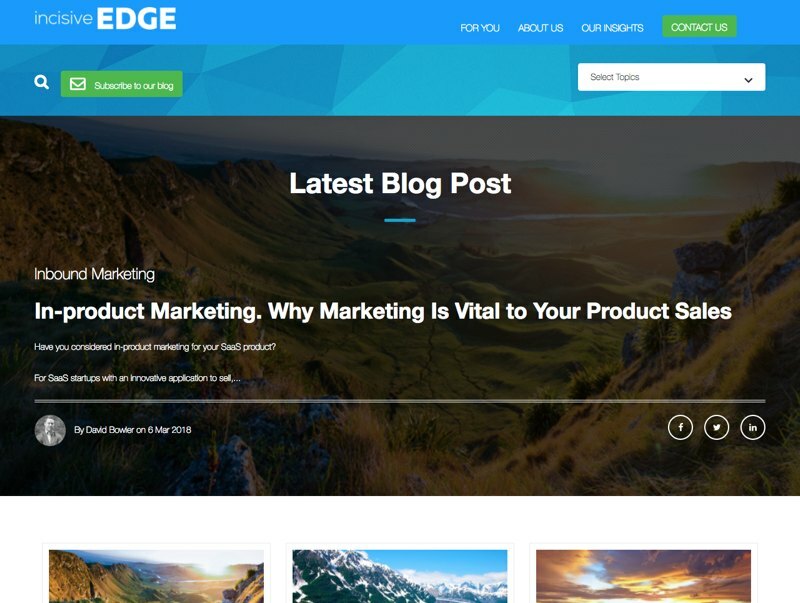 This technical edge is also balanced by articles such as “How to Use Salespeople to Fine-Tune Your Website for Higher Conversion Rates” which drills down into uncovering knowledge you already have in your organisation to drive up your website conversion rates through addressing the concerns your potential customers have with your messaging. 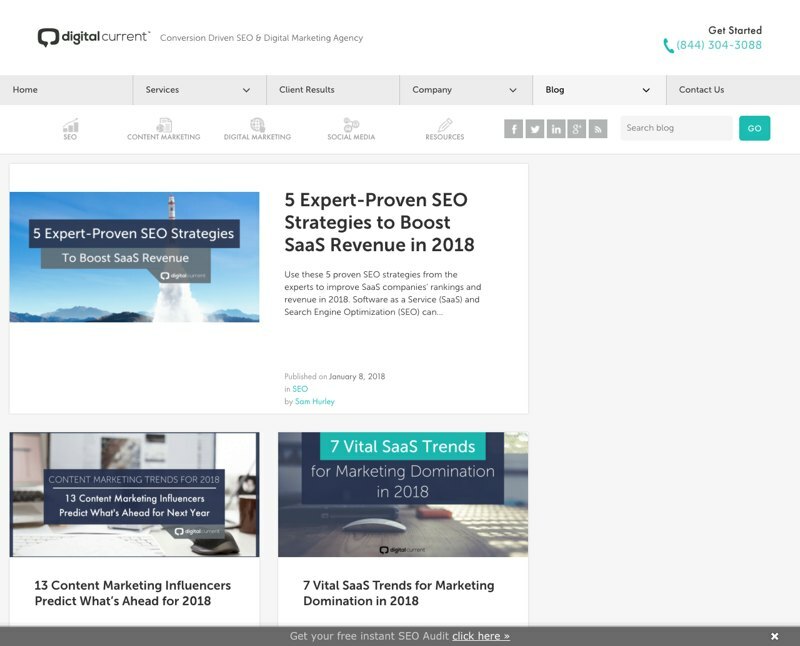 A nice mix of deep dive articles on SaaS, roundup articles from industry thought leaders, and in depth posts from top notch industry bloggers such as Sam Hurley, Brian Honigman, Kristi Hines and Rebekah Radice. You’ll find articles covering SEO, Content Marketing, Digital Marketing and Social Media. I particularly liked Rebekah Radice’s post “How to Create an Irresistible Lead Magnet and Grow Your Email List” which as well as explaining exactly why you need lead magnets, goes on to covering all of the key points to consider when designing a lead magnet and setting it up for success! Other posts commonly cover the specifics of marketing for both e-commerce and SaaS companies. Topics covered include content marketing, customer experience, marketing analytics, marketing automation, research, strategy and sales enablement. There is a nice split between the technicalities and mechanics of running B2B marketing campaigns and the psychology of messaging and execution. I found Kristin Carideo’s articles particularly informative (Kristin is Yesler’s Director of Marketing Automation), and her post “Is your lead database your company’s junk drawer” super relevant in the light of GDPR. 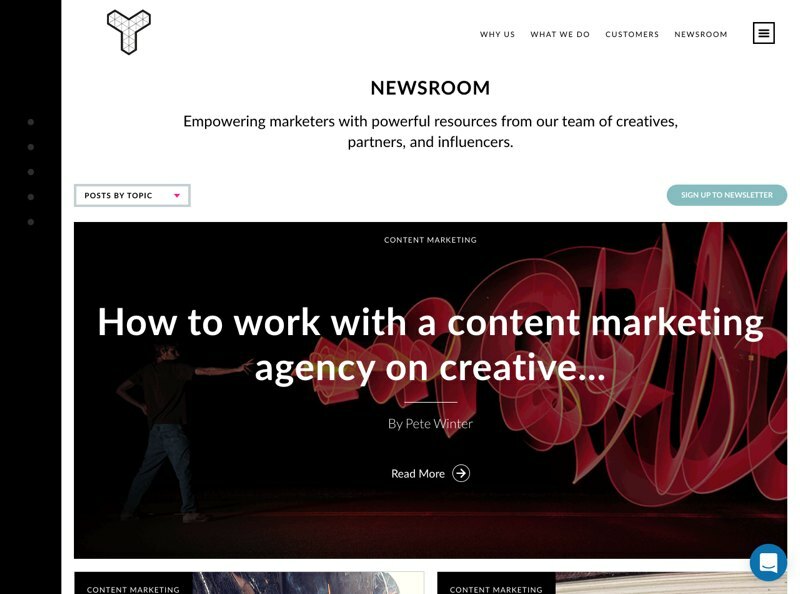 Interestingly, Yesler were recently named in the 2018 Chief Marketer Top Agencies, a new list of B2B agencies that focus on integrated approaches to engagement and activation. 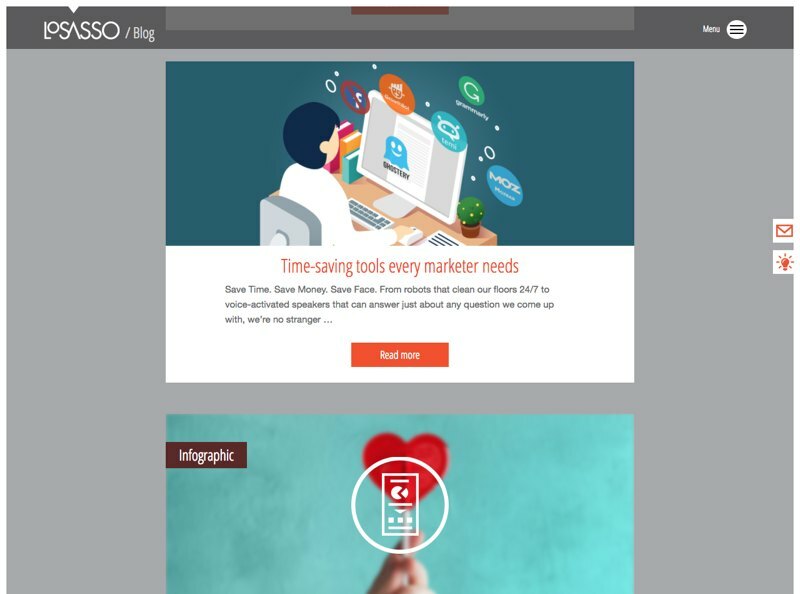 There are some great resources available such as this marketing automation platform guide you should check them out, you won’t regret it. I was welcomed by a great range of post topics right from the blog’s main page. SEO, personalisation, conversion rate optimisation, marketing automation software, lead nurturing and reporting. Awesome! The articles are in depth with occasional walkthroughs of how to implement some tasks in their chosen marketing automation system. Buyer personas, customer lifecycle journey stages and the deployment and optimisation of content are all well covered. Plus, as you move from one article to another you get a sense of how these pieces fit together as a complete approach. Frequent bite sized posts that cover a diverse range of tools and techniques. 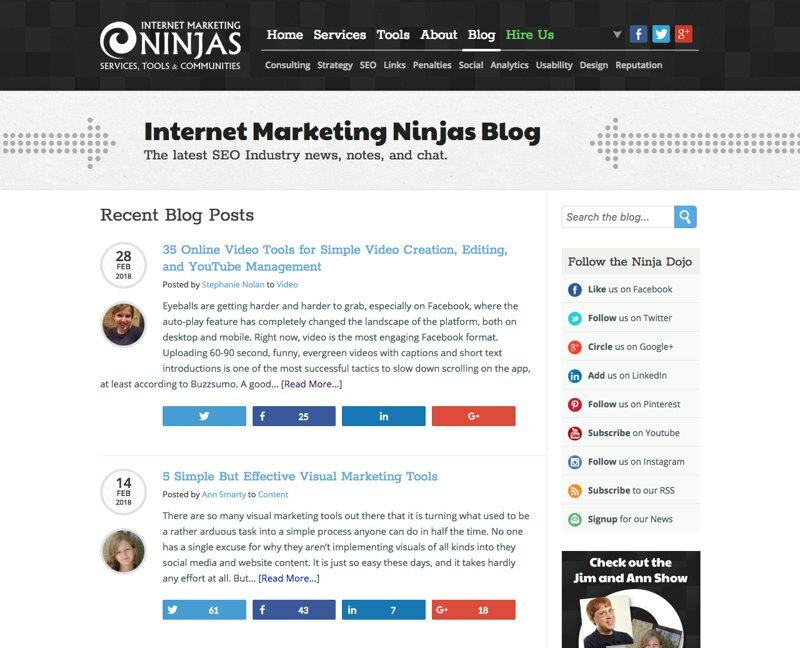 There’s a real sense of community around IMNinjas and posts generate a high volume of social shares. Posts feel fast paced and are easily consumed, there’s also a real vibrancy to the blog. With both Jim Boykin and Ann Smarty being well known internet marketing figures. The KoMarketing blog covers search, social media, and content marketing. Posts often explore the cost effectiveness of strategies and techniques, providing real world insights into areas such as PPC and programmatic advertising. 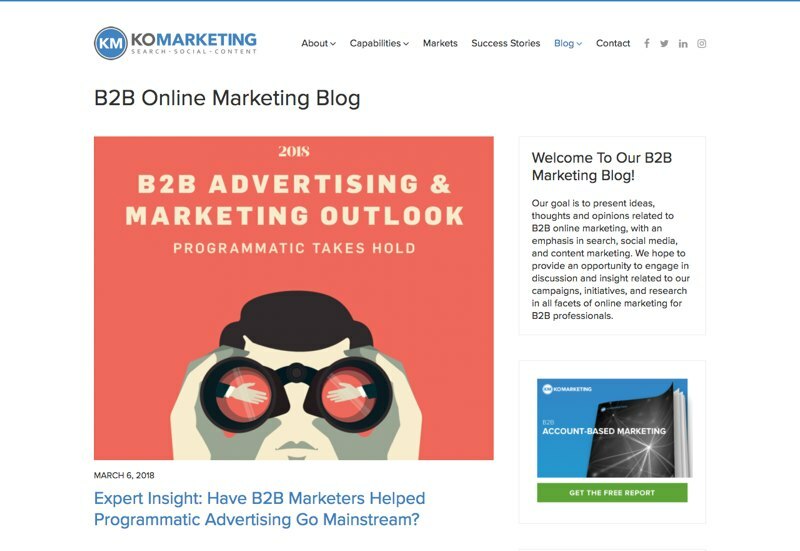 As well as the blog, KoMarketing has a B2B Marketing Industry News section, which is packed with news, statistics and research. Between the blog and the news section, KoMarketing have it covered. 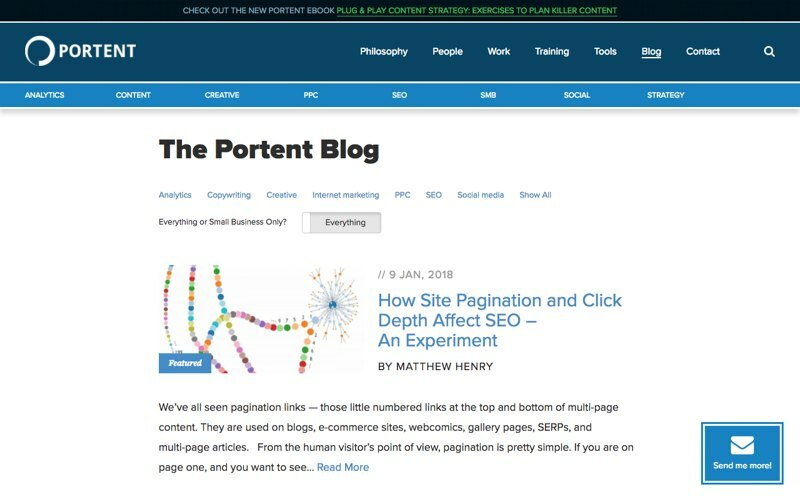 If there was a universal yardstick of blog quality recognised the world over the writing and thinking here at Portent would be 2 notches higher than anywhere else. Ian Lurie’s writing is easy going, packed with great ideas and communicates real generosity of spirit that I can imagine has played a large part in his and his business’s remarkable success. Seriously, please read this blog, and learn how it should be done. Apart from the great range of awesome SEO based content, there are also some gems on email marketing, remarketing, and social media. As well as the specifics of SEO, there are great posts on the implementation and management of SEO campaigns from measurement and goal setting to copy writing guides for SEO success. 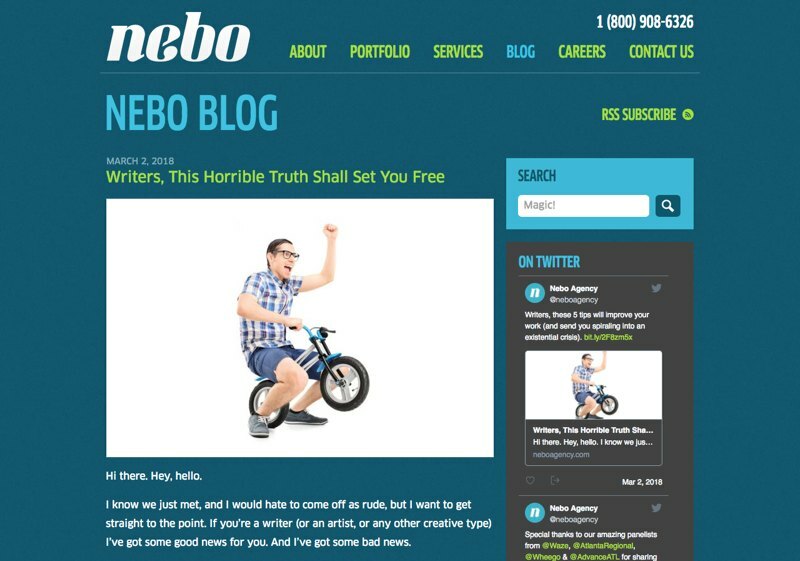 With a human centred approach to digital, Nebo’s blog is packed with personality. Reading it feels like chatting with their team, which is really refreshing. Subjects include, SEO, content marketing, consumer & industry trends, and Groundhog Day. Siege Media describe themselves as a team of clever creatives, sharp marketers and savvy SEO’s. And they are. Nothing here is accidental, the use of video inside blog articles to drive up page dwell time, and supported by the transcript is very nice. Videos are really well produced and of course all on their YouTube channel. Use of design is strong and confident throughout and the material is a series of deep dives into the nuts and bolts of getting SEO and content marketing to really mesh together. I loved the article “How Much Does Content Marketing Cost?” by Ross Hudgens (Founder and CEO) with the screenshots and prices of blog posts and infographics, a great yardstick to measure content marketing by! 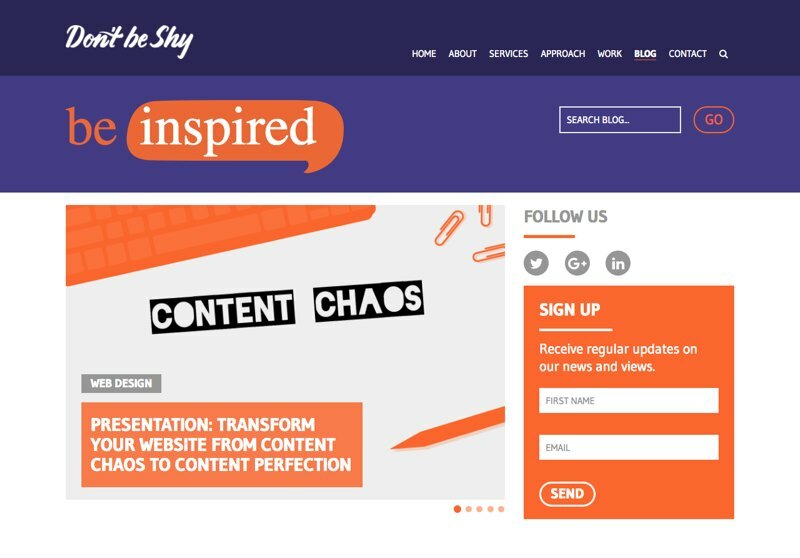 With a range of articles covering content marketing, brand and marketing strategy, blogging and web design, Don’t be Shy have a strong focus on writing posts that cover the key topics of great B2B marketing, from the importance of defining customer persons to personalisation and crafting a customer journey. TopRank Marketing are well known in the marketing industry and with good reason, their content is up to the minute relevant, shows real insight and draws useful conclusions from the data they uncover. Each article is a good solid read and leaves you wiser than you were before you started reading. 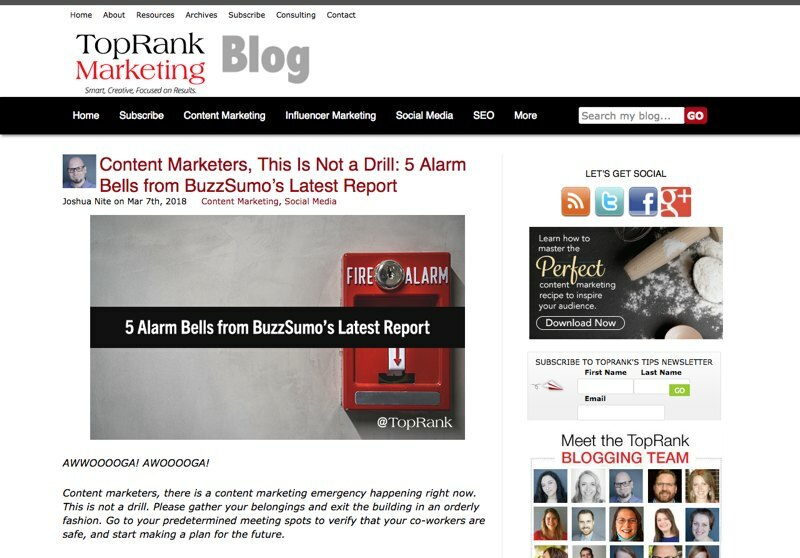 I loved the “Content Marketers, This Is Not a Drill: 5 Alarm Bells from BuzzSumo’s Latest Report” article, which covered a range of data points around content marketing highlighting the way in which the industry is changing and what we may well need to start doing in order to see success from our efforts. Wow! In the Vertical Measures blog header they recommend that you check back 2-3 times a week to catch updates and they’re not wrong. There’s something new every few days here, from productivity to SEO, PPC, content marketing and social media. The blog posts are really comprehensive and thoroughly explore each subject. 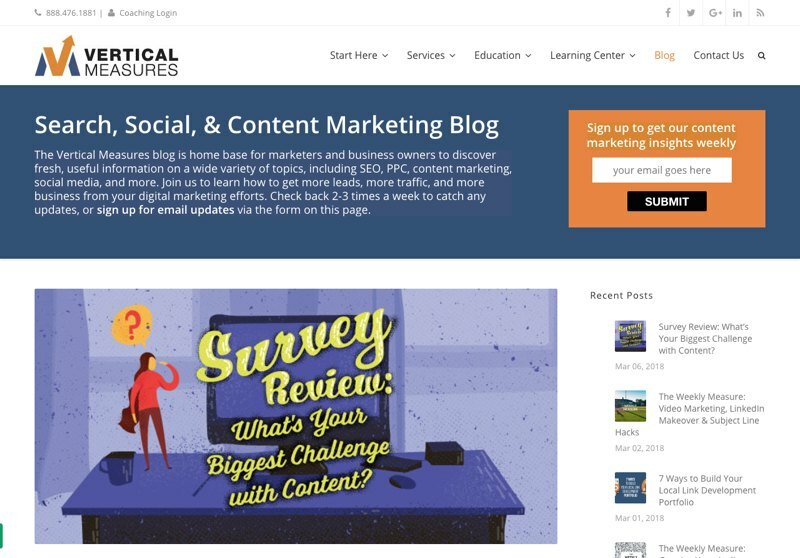 I loved “Survey Review: What’s Your Biggest Challenge with Content?” where the Vertical Measures team broke out research from a ClearVoice survey to identify common pain points in creating and managing content. 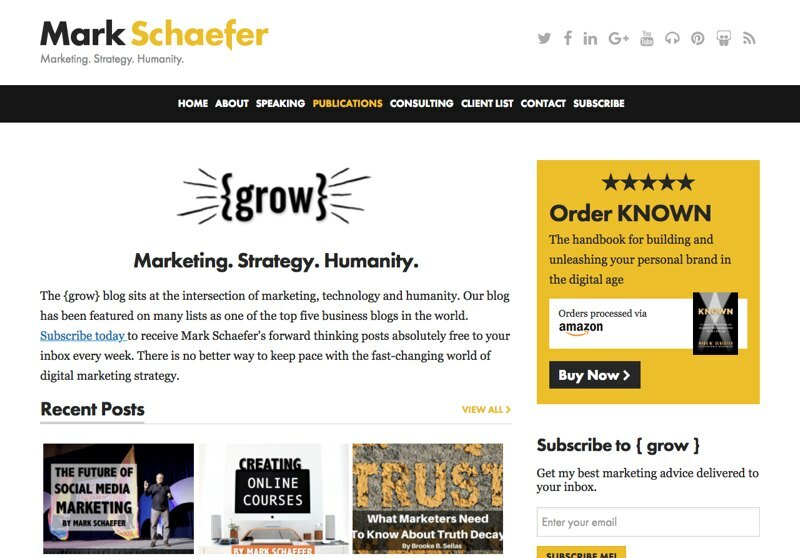 Mark Schaefer’s blog sits at the intersection of marketing, technology and humanity. With articles that cover the state of marketing and the forces that are acting to shape it’s direction in the future. Thought provoking content that covers AI, the erosion of a common understanding of truth, and the challenges inherent in being successful in an ever changing technological landscape. Contributing columnists provide a range of content that always works well with the overall tone and positioning of the blog. 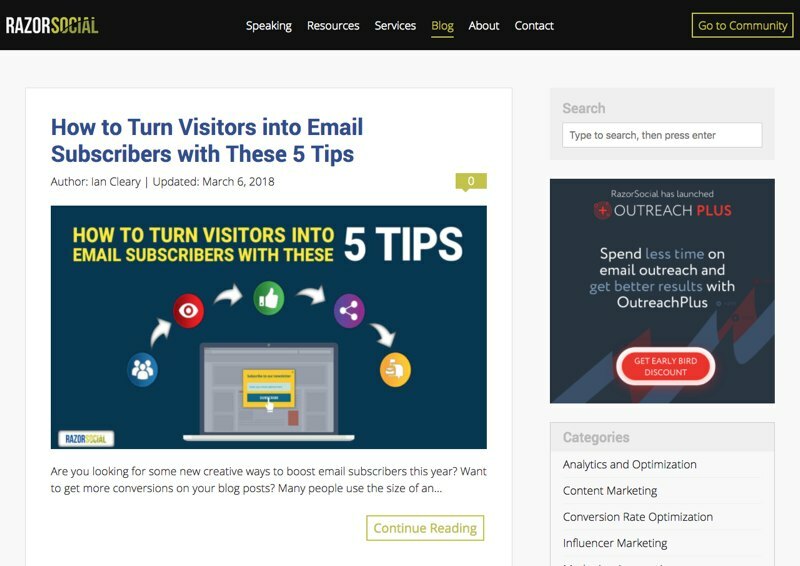 Tips for turning visitors into email subscribers, the upside of declining social reach, how to know if your content marketing is effective. That’s just the first 3 posts! Razor Social is great, ‘hands on’ content for B2B marketers who want to get their sleeves rolled up and make a difference. 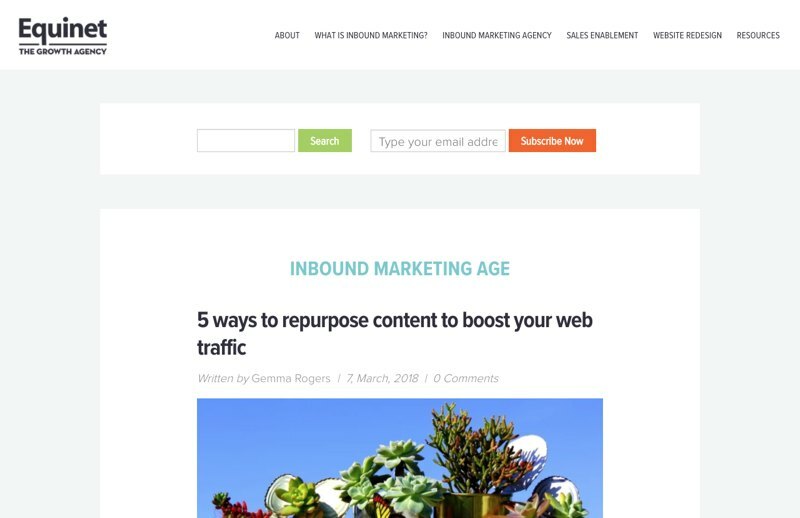 In the article “How to know if Your Content Marketing is Ineffective” Ian Cleary looks at converting visitors into email contacts, building a content conversion funnel, taking apart for shareable the content is, generating backlinks and measuring your Domain Authority. Awesome stuff! 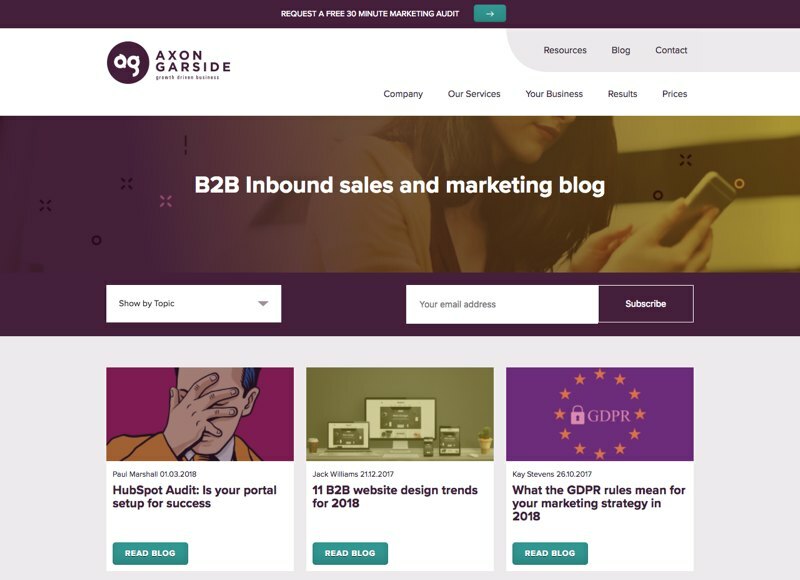 Strong devotees of the inbound method, Axon Garside cover the pressing issues for B2B marketers, from lead generation, social selling and GDPR to more technical issues that impact SEO such as SSL certificates. I particularly enjoyed “8 B2B lead generation strategies for 2018” which has some great advice on building the perfect lead capture form, from staying solution focused to using logical conditioning and asking appropriate questions based upon the value of the content you are working with. 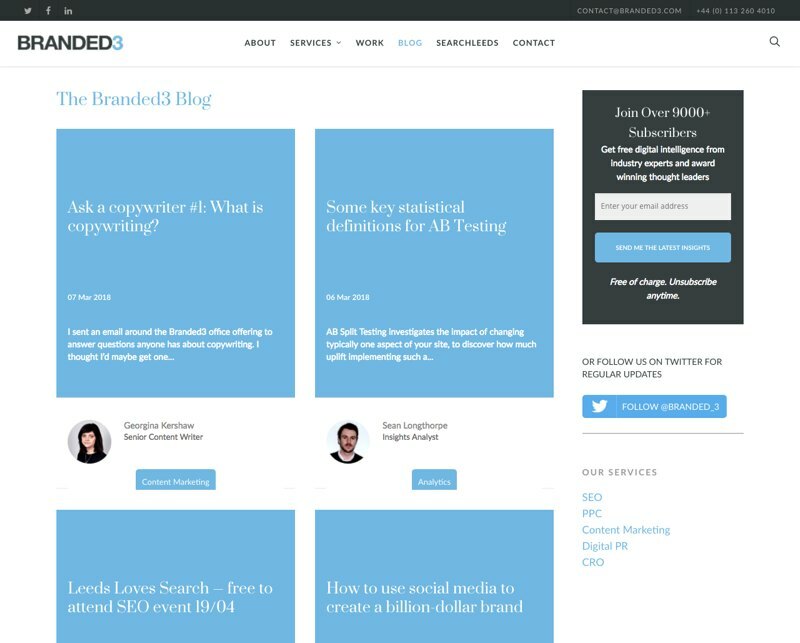 There’s plenty to get your teeth into on the Branded3 blog, with new posts every few days and a great range of marketing topics from CRO to PR, social, SEO and analytics. It’s also great to see so much content being generated by staff, you get a real sense of their expertise in these diverse disciplines. I really enjoyed “Micro and macro goals for your CRO strategy” by Jon Greenhalgh, it’s easy to get caught up in the bigger picture of macro conversions such as new leads or sign ups. But Jon makes a great case for not overlooking those micro conversions that can help you shift the needle for the whole customer journey. Xander focus their expertise squarely at the SaaS marketplace with posts geared towards the specifics of growing a software service. Whether you should use chatbots, the ins and outs of retargeting, mobile first and managing product demos. There’s lots of interest here if your flavour of B2B is SaaS, I learned that Marketo spend 66% of their $98,800,000 revenue in sales and marketing. Wouldn’t it be lovely to that budget! 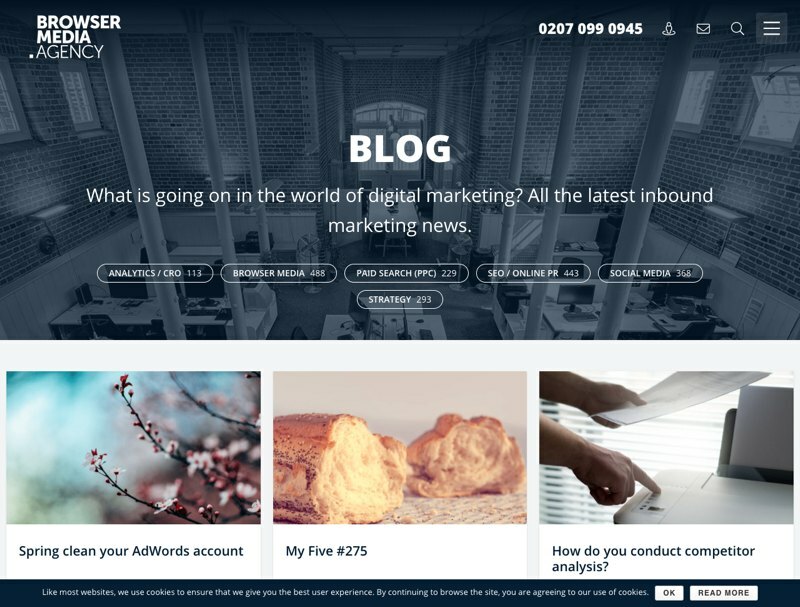 Allister is UK digital personality of the year, and according to it’s intro page his blog is already a UK top 50 marketing blog! The posts are interesting observations on marketing and technology mixed with curated content. My favourite article is “The Vicious Circle of Social Media ROI” which breaks down key challenges from the 2017 Convince & Convert ‘State of Social Marketing report’. Notably the inability to measure the ROI of social media, and consequently secure the investment to do it better (and therefore potentially measure its ROI). 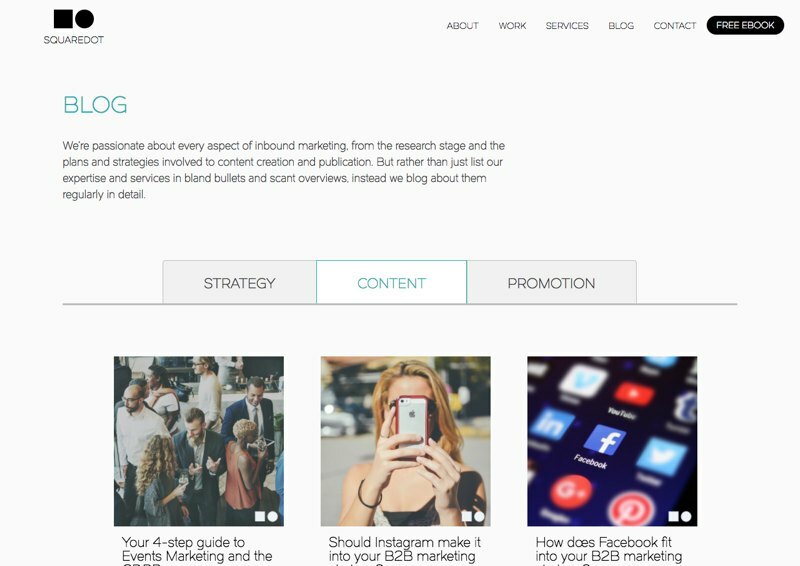 “Thoughts, opinions, chatting, sharing and all that.” With a relaxed and confident tone, the Run2 blog covers Digital Marketing, Conversion, Engagement, Outreach, Design and Development. I found their ‘Outreach’ category interesting and distinctive in equal measure. Many agencies tend to roll any posts on influencer marketing into content marketing, but by breaking it out into it’s own category Run2 are highlighting their experience and credibility. 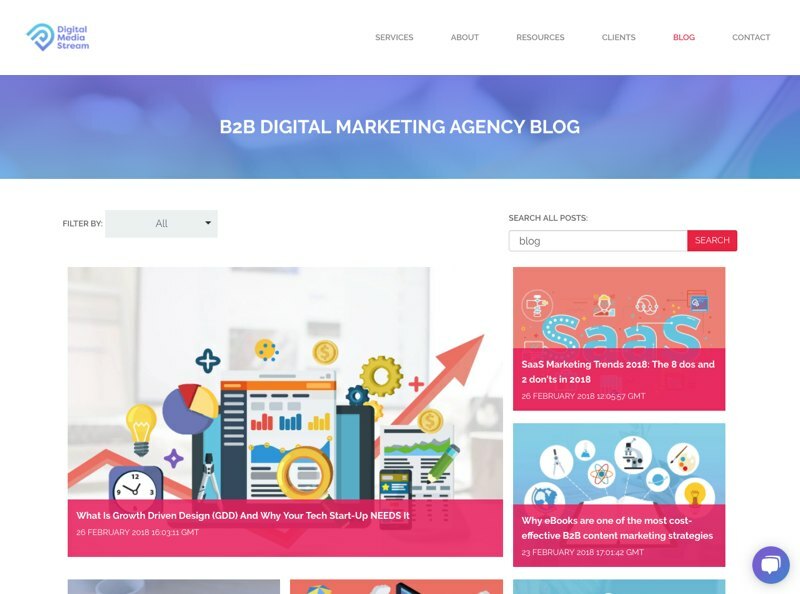 The IT Marketing Agency have a practical, no nonsense approach to their blog, with articles on B2B, Content Marketing, Digital Marketing, Marketing Strategy, Sales and Marketing Alignment. The content is geared very much towards IT companies, and the tone and depth reflects their knowledge in technology. 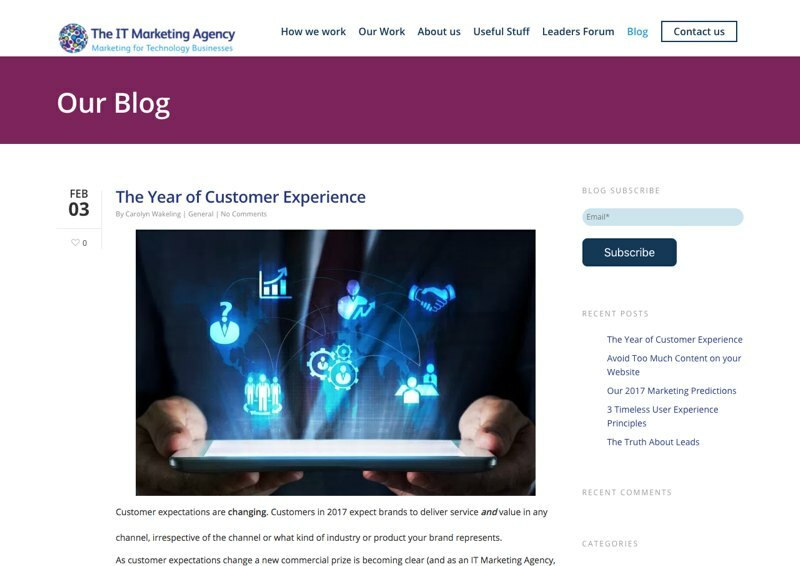 My favourite article is “The Year of Customer Experience” which picked up on the shift in marketing to an emphasis on Customer Experience (CX), and how in the future marketers will be measured on customer retention, engagement, and lifetime customer value. Requiring a much more holistic view of marketing. The Rice blog has an amazing range of content spanning 20 categories (I wont list them all), with articles being published every few days. The quality is excellent, I loved the “A Guide to the New Search Console : Performance & Index Coverage” which is a deep dive into the specifics of Google’s updated Search Console. Lots of great information including some of the issues the data highlighted and how those issues were fixed. 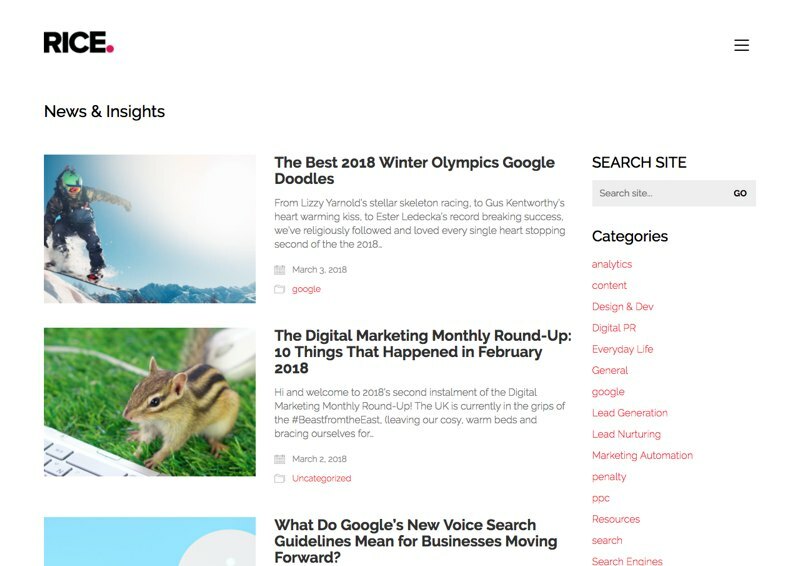 Aside from technical articles there are posts that pick up on technology news particularly with respect to the impact on businesses, and more general articles for example exploring the relationship between Digital PR and Link Building. Definitely one of my favourites of the bunch. 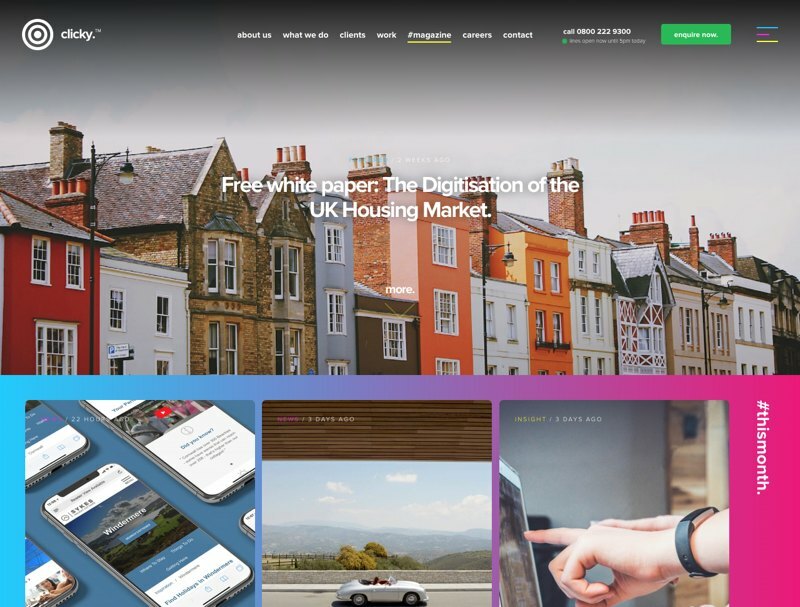 The Yellowstep blog is colourful and energetic, with articles covering Branding, Digital Marketing, Guest and user Experience. I loved “The importance of building brand awareness through digital marketing (and how to do it well)” by Robbie Jones, as the post not only explored and broke down top of funnel activity, but backed it up with the Attract / Convert / Close / Delight inbound marketing strategy steps. 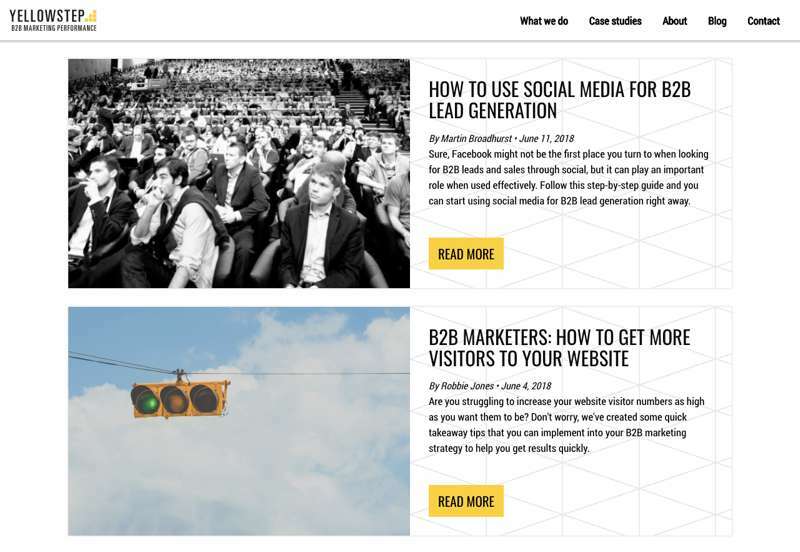 With a range of other posts covering how to name and build your brand, Yellowstep provide a solid resource for growing your B2B business. Incisive Edge have a very strong focus on SaaS and inbound. 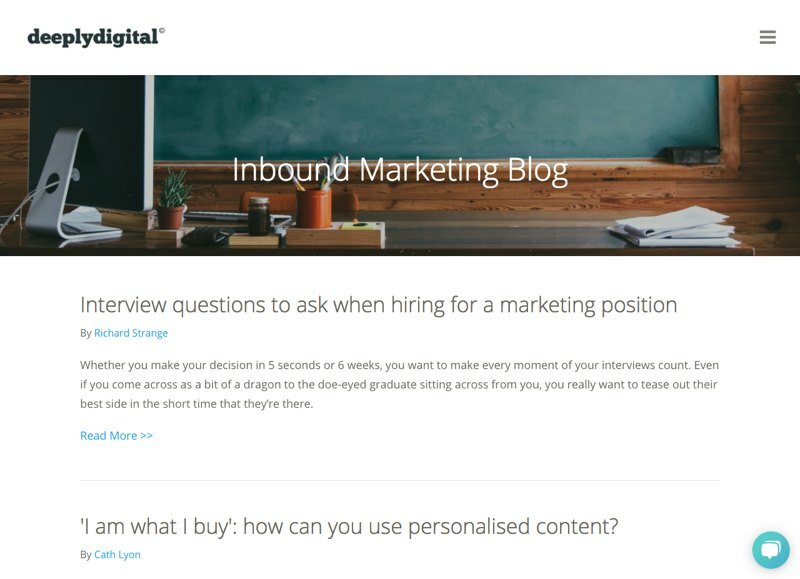 Their posts are really interesting (particularly if you are running a SaaS business) and cover pain points such as increasing trial / demo conversions, along with articles exploring benefits derived from employing inbound marketing automation. Posts are well researched, reasoning and application of insights is solid, making the blog authoritative and credible. I particularly enjoyed David Bowler’s article “In-Product Marketing. Why Marketing is Vital to your Product Sales” Which champions building marketing into a product so as to treat product use as a qualification and on boarding mechanism. 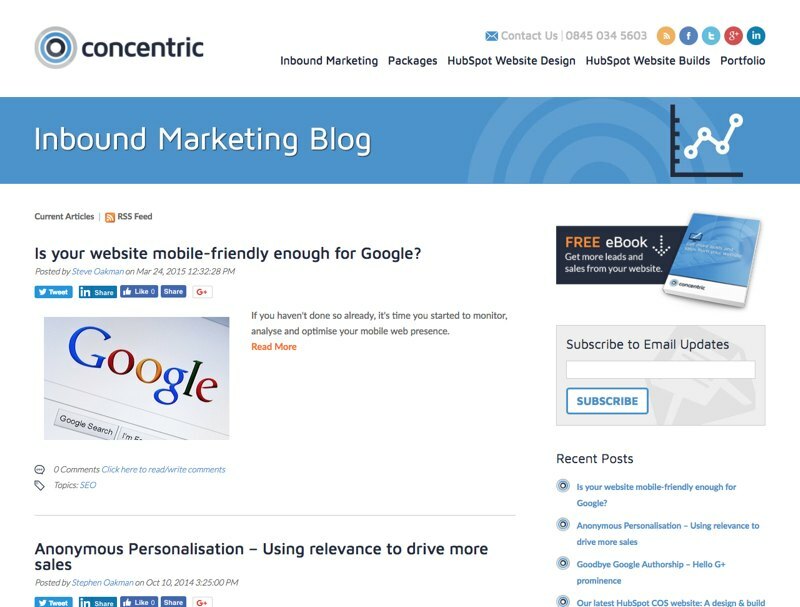 A super solid inbound marketing blog from Equinet, with posts covering all aspects of attracting, converting and nurturing leads through your marketing funnel. You do have a marketing funnel, right? The posts here go well beyond the “This is how inbound works” type fare and explore topics like how to analyse conversations on social platforms in order to flesh out buyer personas and using Pillar Pages as part of your SEO architecture. 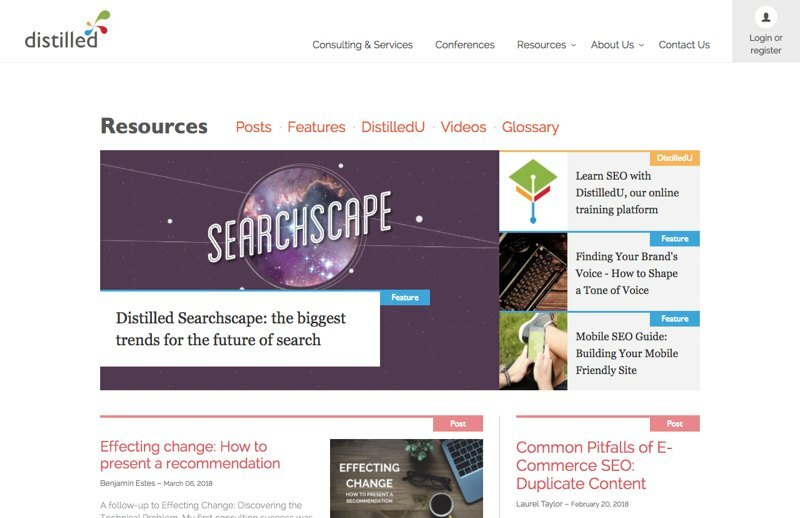 Distilled cover a range of topics from CRO to Email Marketing, PR & Outreach to SEO, Social Media and Video. Posts are frequent and diverse with recent additions covering “What mathematics can teach us about email marketing” and “Six Optimization Tips to Get More YouTube Views”. 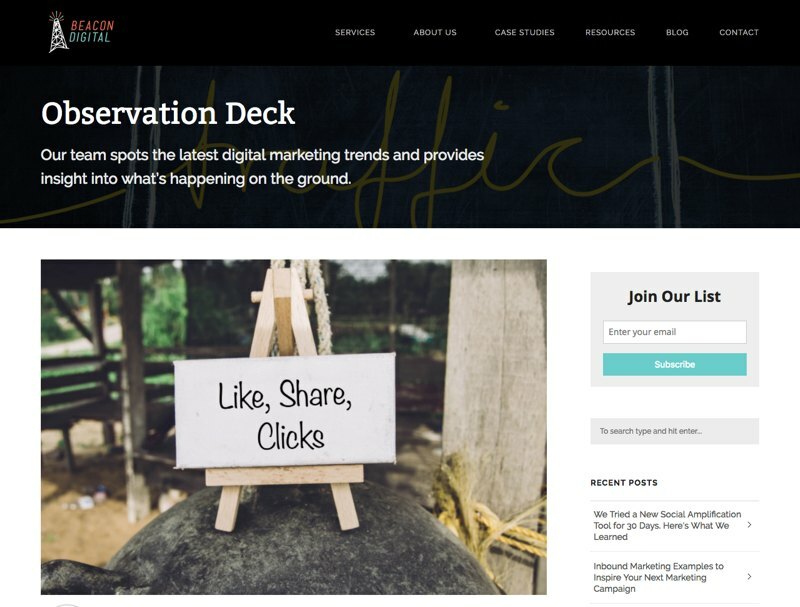 Interestingly while Distilled are still a consulting business they have built out their resources into an online learning offer called ‘DistilledU’ which offers a comprehensive range of online video content. I really enjoyed “Unconventional Content: PR Stunts for SEO” which follows a PR stunt for Interflora for Workd Kindness Day, where memeers of the general public are asked to pass on a rose to a stranger. Goals, Primary KPI’s and Secondary KPI’s are measured and reported. The articles commonly dive into the practicalities of setting up and running marketing automation from defining personas to implementing nurture workflows. Although the articles are written from a HubSpot perspective the details are platform agnostic enough to be useful for whichever marketing automation platform (MAP) you are using. 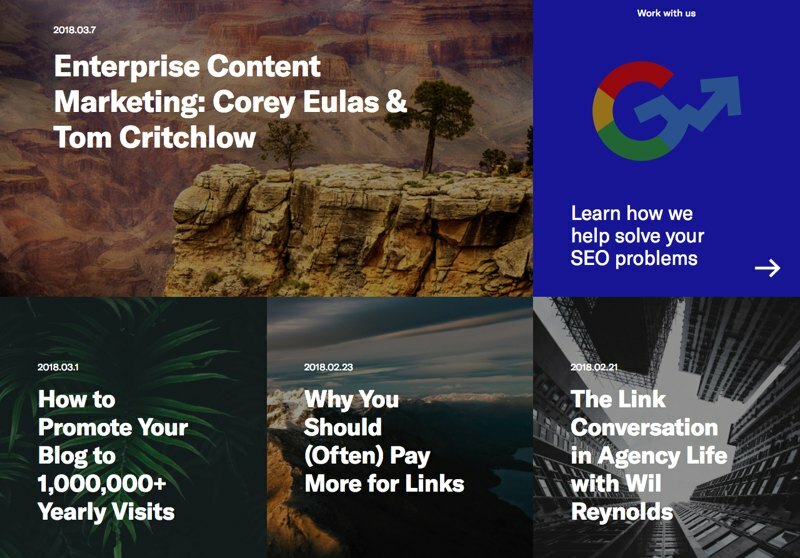 Article topics on the Concentric Marketing blog include business blogging, buyer personas, CTA’s, content marketing and copywriting, with some SEO stuff thrown in for good measure. I enjoyed the “Anonymous Personalisation – Using relevance to drive more sales” article by Stephen Oakman, which looks at how you can use personalisation based upon geography, the visitors device, and even referral source to make your content more targeted and effective, without even having cookied a visitor through a lead form conversion. This is a technique I can see will be particularly useful in the light of GDPR. 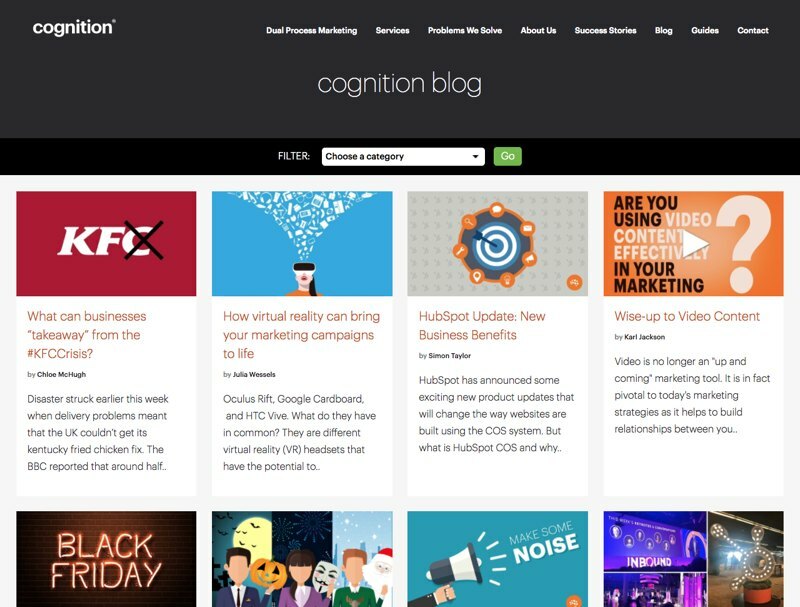 With a fresh mix of posts covering PR, technology, SEO and content marketing, Cognition understand the importance of mixing topical and seasonal content with the more evergreen content that demonstrates their knowledge and capabilities. I read a lot about marketing, and whenever I come across a piece of writing that has an original take or mixes up ideas in an interesting way it really stands out, and Tim Witcherley’s post “Biases, Experts and 5 Steps to Building an Effective Marketing Strategy” did just this. We all suffer from biases in our perception of things and Tim explores that to great effect in the way that we originate, develop and implement our marketing strategies. The design and interaction of the Clicky blog (#magazine) is second to none. To be honest I had to check the source code to see what it was built with (WordPress BTW). 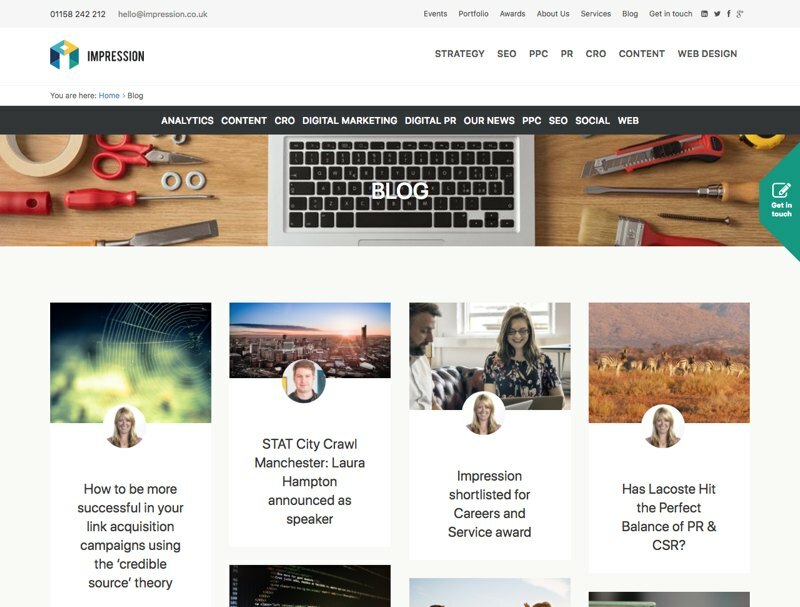 With a mixture of company news and technology / industry insights the content gives you a good feel for the company culture, whilst at the same time mixing in articles on utilising audience data, interpreting Google’s PageSpeed insights, and even GDPR compliance through the lens of Manchester United! If you’ve every wondered how SEO is like curling, or need to know how to brush up on competitor analysis this is where to find your answers! With posts covering analytics & CRO, SEO, social media, strategy and PPC Browser Media have something for everyone. I really loved their ‘My Five’ series of posts, where staff round up important news that has a marketing slant. 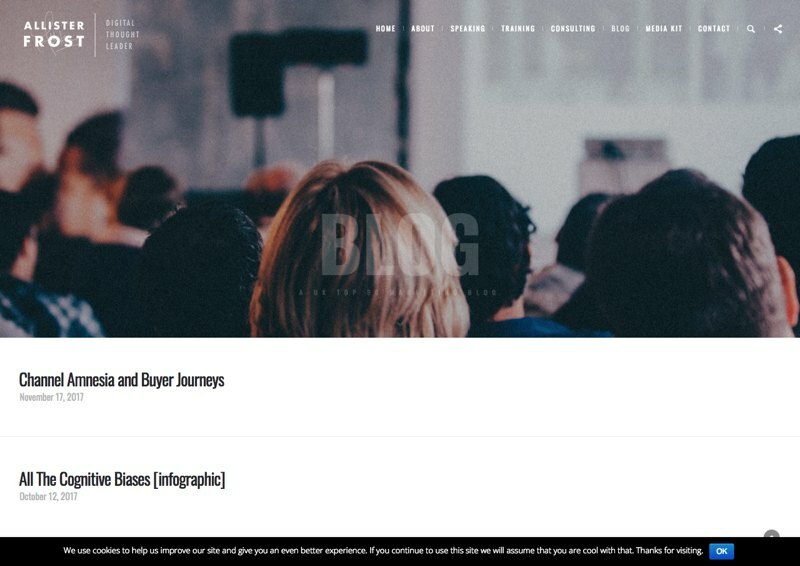 With a range of articles that cover all aspects of B2B inbound marketing, Blend have done a deep dive on inbound and come up with a super actionable content packed blog. From B2B content marketing tips to blogging tool run downs and how to use video for B2B lead generation. I really enjoyed “What is a Marketing Qualified Lead (Really)?” where Phil Vallender discusses the conflicting definitions of a Marketing Qualified Lead (MQL), and proposes that a buyer centric definition is more useful as the buyer is really the only person that can decide as to whether they are ready for Sales. This of course requires automation based upon behavioural triggers that recognise buying intent and act accordingly. 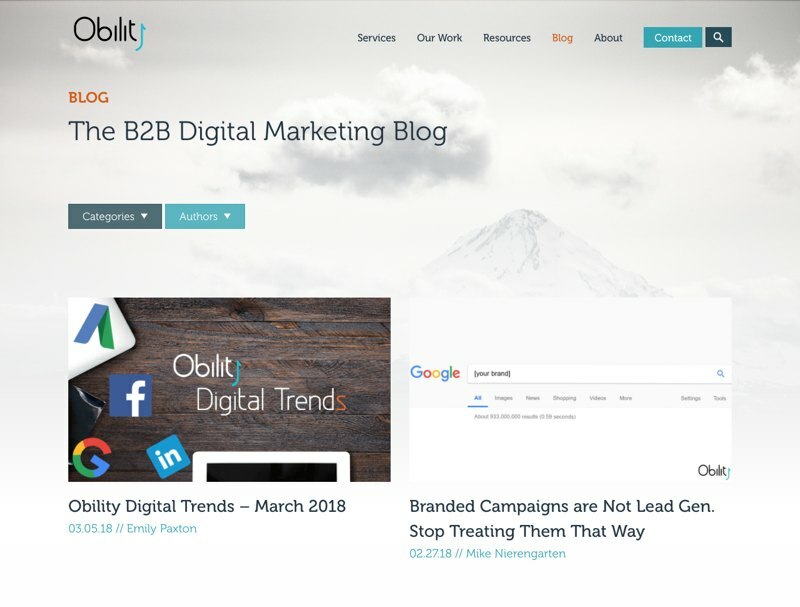 With Obility’s blog there’s a real sense of the posts exploring the topics that are current, relevant and significant. And that’s important, because there are any number of things you could be doing. It’s what you should be doing that matters. Posts cover a wide range of B2B topics and there is obviously a deep level of paid search / paid social experts going on here. Which is mixed in nicely with digital trends reports and deep explorations of campaign strategy. Beacon Digital bring you the very latest digital marketing trends and insights in their marketing blog. With inbound marketing examples to inspire you, help on defining buyer personas and just why B2B video marketing should be your top priority in 2018. My favourite post is “7 Inventive Ways to Improve Your Organic CTR Using Google Search Console” which walks through a great bunch of checks and measures you can use to boost your organic search performance. I was really taken with Mark Schmuckler’s post “How EOS Can Drastically Improve Your Marketing & Sales” which walks through the Entrepreneurial Operating System (EOS), a framework for defining core characteristics of a company and driving that through structure, staffing and communication. A fascinating read and I’m certainly going to be diving into Traction by Gino Wickman to learn more. Other posts deal with a great mix of topics from brand messaging in “Are You Making These 5 Brand Messaging Mistakes?” to LinkedIn with “How to Launch a Successful LinkedIn InMail Campaign” and the latest trends in “4 Hot Digital Marketing Trends to Warm Up Your Leads in 2018”. 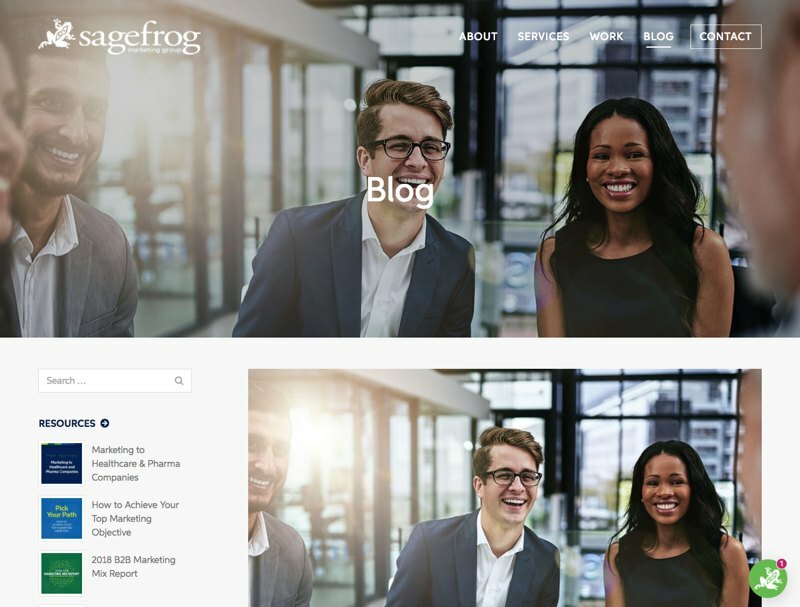 Sagefrog come across as technology agnostic, with a deep understanding of B2B issues, from a sales and marketing perspective as well as a business management one. 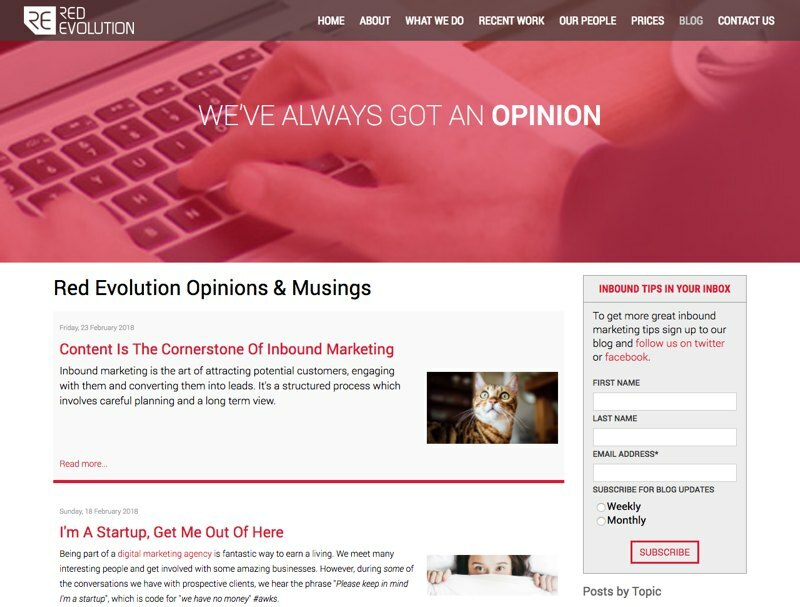 Red Evolution have focused right in on SEO and lead generation through the lens of inbound marketing. The posts have an authoritative tone of voice and are a great read for getting up to speed on the processes involved in building a lead generating website. My favourite article is “The Web Based Lead Generation Checklist” which nails all of the bigger picture processes behind effective lead generation that can prevent success further down the line. 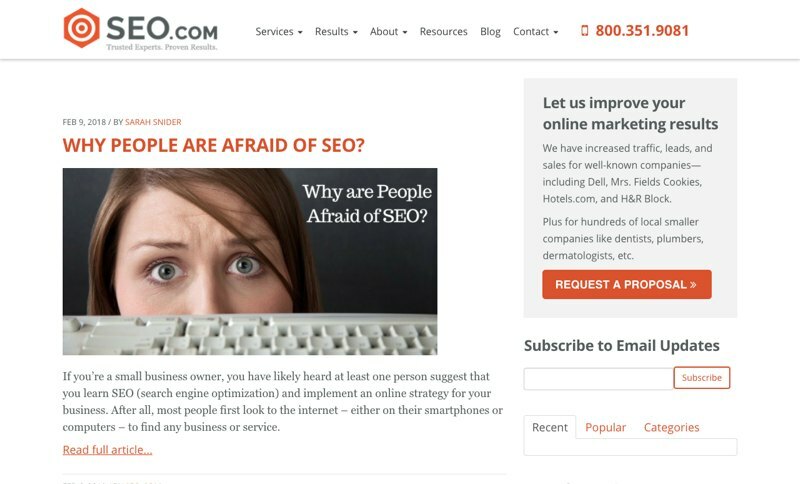 Some great in depth articles on SEO, mixed in with content marketing, CRO, PR and social. I particularly enjoyed “Engineering your website architecture for great search engine optimisation (SEO)” by Aaron Dicks which has a great range of technical advice and I must say I agreed with the insight shared by Laura regarding journey optimisation. As ultimately Google is aiming to deliver the best content and how people behave (pogo-sticking etc) are becoming increasingly important. 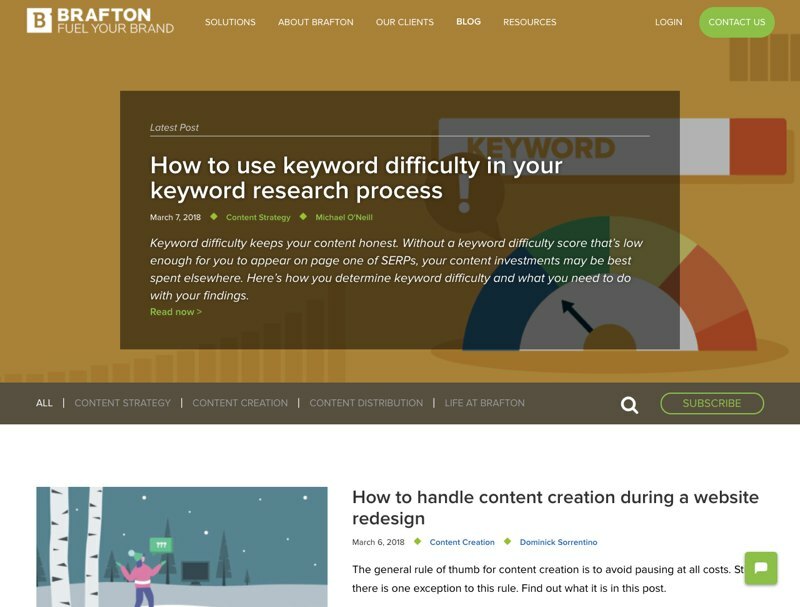 Brafton are smashing it here, they are all about content and it shows. The illustration style and tone of their blog is super easy to read, and super friendly too. Whilst the depth of content and degree of research that goes into each post is breathtaking. “The modern user is a proper content connoisseur. You need a master chef that has experience cooking up a diverse menu of content types.” Brafton. 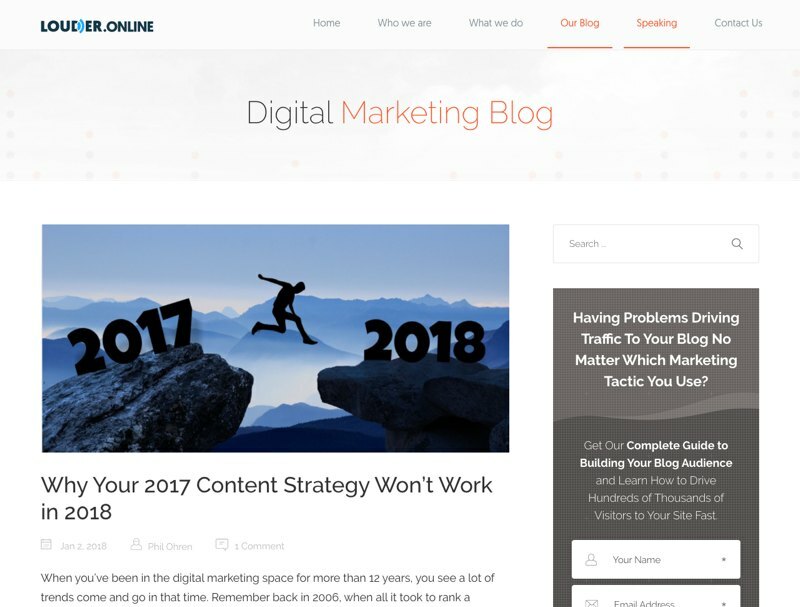 “Why Your 2017 Content Strategy Won’t Work in 2018” by Phil Ohren explores the current state of content marketing as it’s meteoric rise has led to content overload and significant drops in effectiveness. And asks where we go from here. 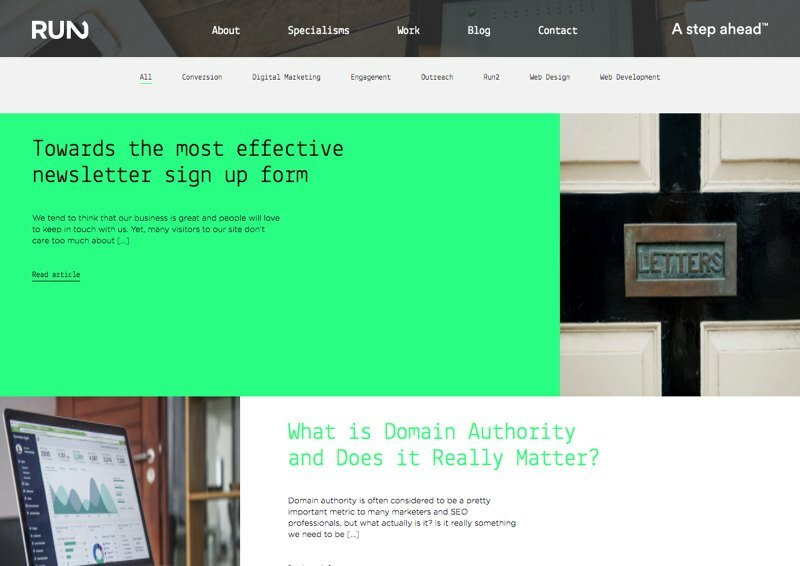 “10 Surprising Case Studies That’ll Change the Way You Think About Landing Pages” in which Gian Clancey turns 10 landing page design best practices on their head. Each example really make you think about why the results came back the way they did. Very interesting! 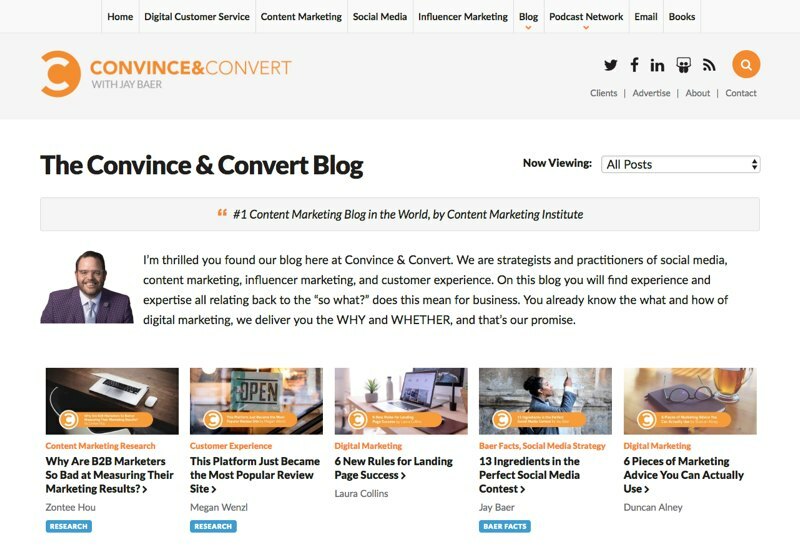 It’s no surprise that the Convince & Convert blog is ranked as the #1 Content Marketing Blog in the World by the Content Marketing Institute. With wall to wall in depth articles on content marketing, social media and influencer marketing it’s range and depth is encyclopaedic. I really enjoyed “6 Unexpected Trends in 2018 Social Media Research” by Jay Baer which picks up on some interesting statistics from research by Edison Research and Triton Digital. (Spoiler) Social media usage is down! 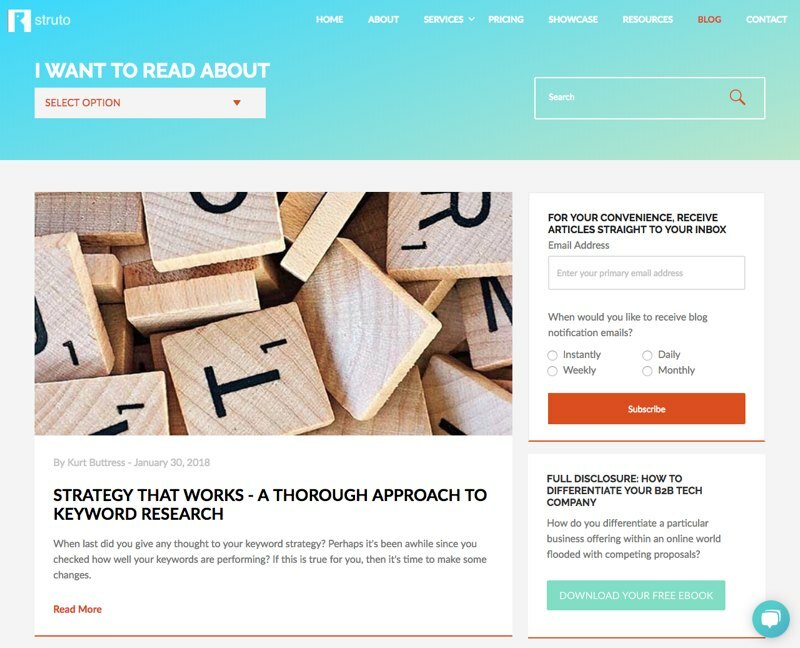 I really like the pragmatic and confident tone of the writing in the Spear Marketing blog, in their website they emphasise that they are technology agnostic, and can speak fluent Pardot, HubSpot et al. Which is refreshing in itself, I think more agencies will broaden their experience in platforms to offer the best fit. I loved the “5 Demand Generation Tips for Start-Ups” because it recognises that gaining traction is different for companies at different stages of maturity, as well as keeping an open and experimental mindset when exploring channels and techniques. 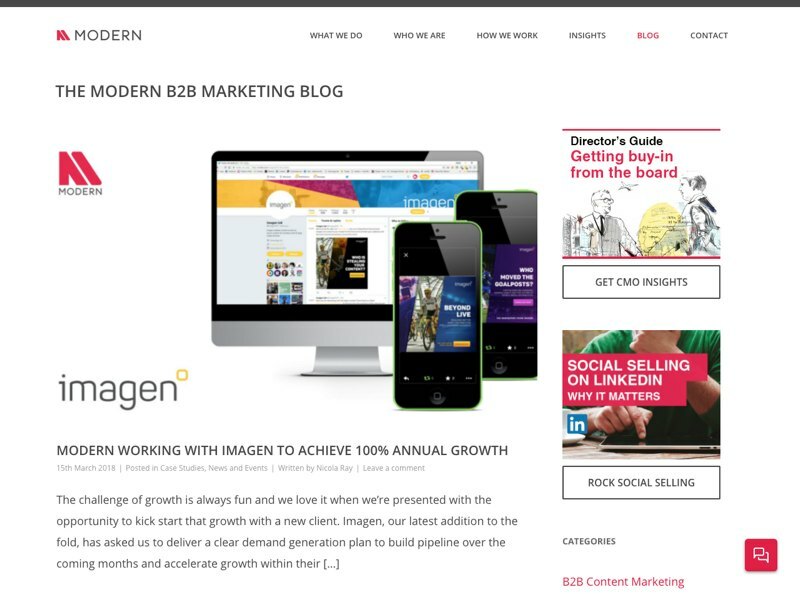 I love the conversational tone of the writing in Modern’s blog, and with topics covering B2B content marketing, strategy, branding as well as lead generation and automation there are posts for everyone. I loved “Why Marketing Automation is a salesman’s best friend” which effectively addressed many of the preconceptions people have about marketing automation that can limit it’s adoption. And also “The cracks within marketing leadership” which throws into sharp relief how the speed of technological change within marketing is creating a lack of cohesion at different levels, allowing effective strategy to ‘fall between the cracks’. 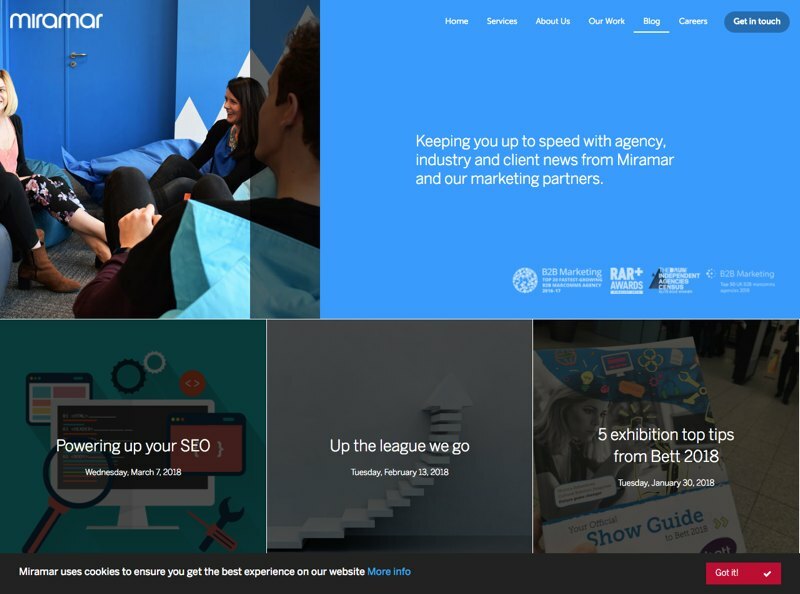 Miramar mix together a healthy dose of SEO, Account Based Marketing, email marketing and branding to address your B2B needs. I really loved the exploration of ABM by George Peachey, entitled “ABM – The Future of B2B Marketing?” which is a super detailed introduction into the benefits and pitfalls of this approach to B2B marketing. 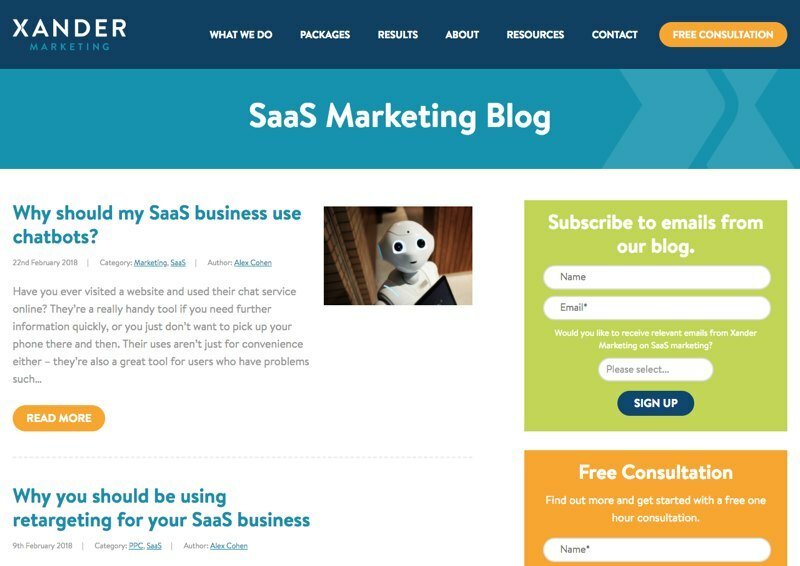 All of the topics you’d expect from a B2B focused marketing agency blog, but with some gems for SaaS businesses such as “SaaS Marketing Trends 2018: The 8 Dos and Don’ts in 2018” and “Churn rate: All your questions answered”. My favourite article is “What is growth driven design (GDD) and why your tech start-up needs it” which outlines a powerful methodology for building in continuous improvement to website development. 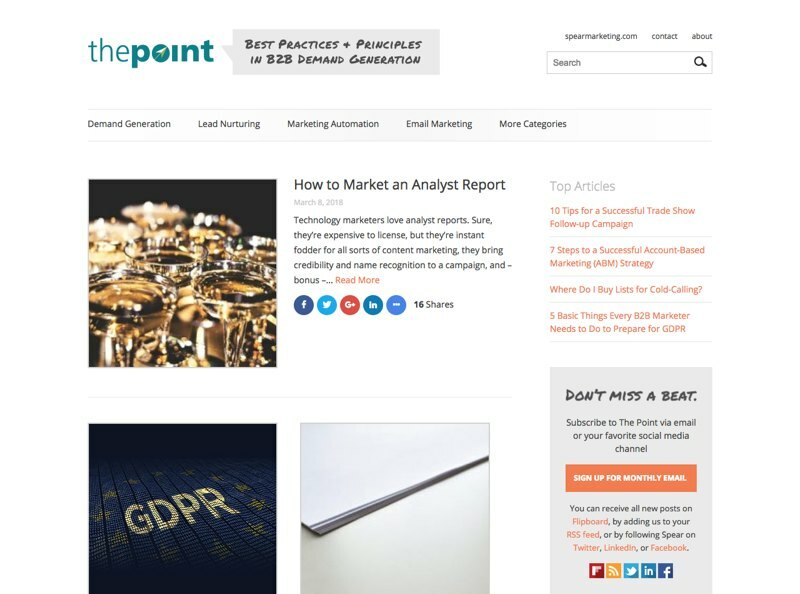 There’s plenty of super topical posts covering GDPR mixed in with content marketing, inbound and even lessons in Content Marketing by James Joyce! 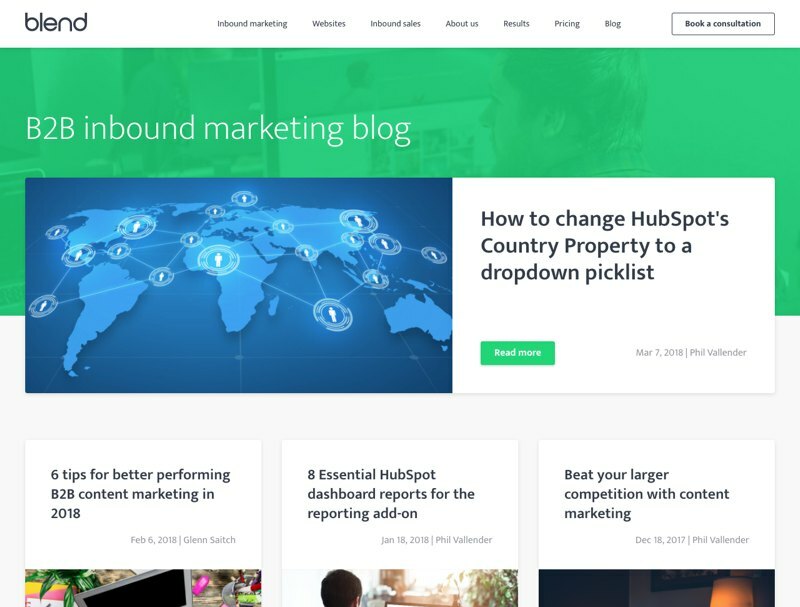 Refreshingly for an inbound agency, Squaredot deal with what to do when your inbound marketing isn’t working, and why content marketing is going to get a whole lot tougher. In a world where content marketing is reaching saturation point and inbound is commonplace it’s great to see an agency dealing with the realities and not preaching to the choir. We're always on the lookout for the best new content, so if you think your marketing agency blog should be on the list, submit it for review. We'd love to hear from you.